Back from the holidays, the months of November and December just flew by. Both months greeted me with a lot of warm hugs and hellos with family reunions and celebrations, kids coming home from college and out of town vacations. I felt like I danced with different rhythms of life and loved it. January is almost over and all of a sudden the music changed into a slower rhythm. Slow mornings like today made me realize that adjusting to life in St. Louis took a back seat. The past two months were all things holiday and family fun. 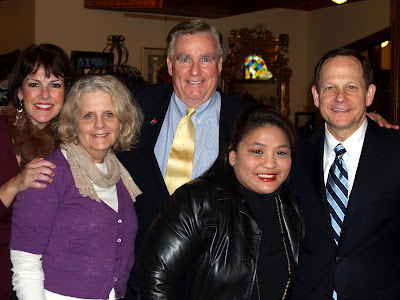 As I go back to the "normal" rhythm of life I would also like to bring back a feature I started when I just moved here to STL: All Good Things St. Louis. Today I will take you to Rue Lafayette. OK, it was because of these signs! What with my brother who just came from a tropical country and my girls from California, the cold temperature begged for a cup of hot chocolate... and boy did these signs call our names. 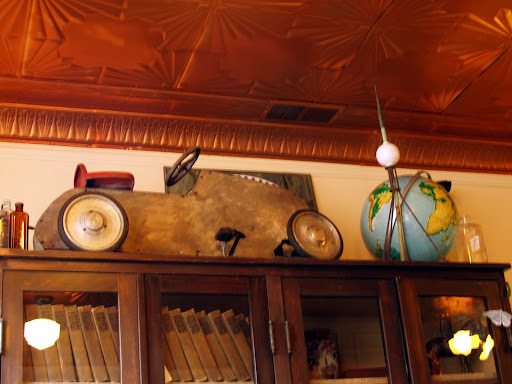 We were greeted with an ecclectic entry way... and my heart skipped a beat as I loved the vibe of the cafe. 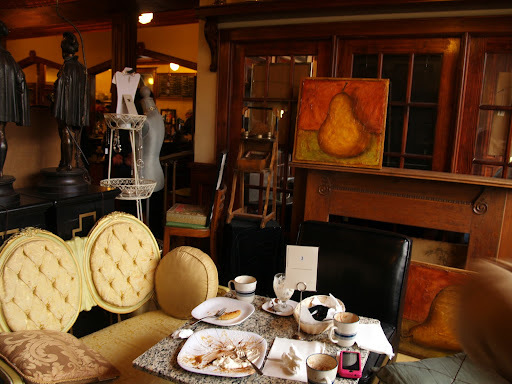 The cafe is within a boutique where you find antiques, jewelry and even French soap. A kindred spirit enclave, and I felt right at home. In retrospect it was not the ambience that made me fall in love with the place, it was the friendly staff and owner, Araceli. She came up to us and figured we were new in town. And our conversation flowed like we've met before. Being a transplant herself she knew how it was to be in a totally new place so she made us comfortable. She even gave us tickets to take my visitors around. Her gesture was like a warm hug that said we got the right place in the right neighborhood. Our firsr order? 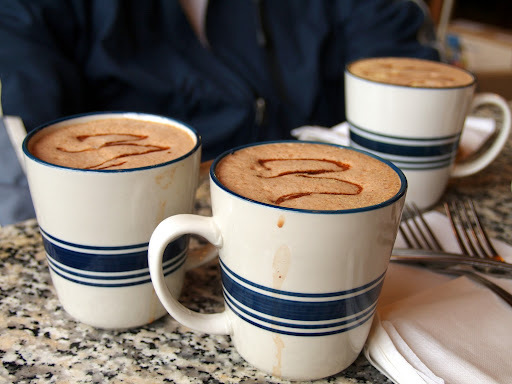 You bet it had to be "the best hot chocolate in the world", and boy did it really delight us. With temperatures in the mid-40's (Farenheit), a warm frothy mug of chocolate hit the spot. 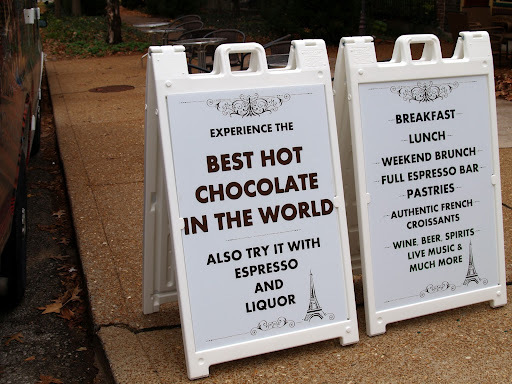 The croissant is also highly recommended. 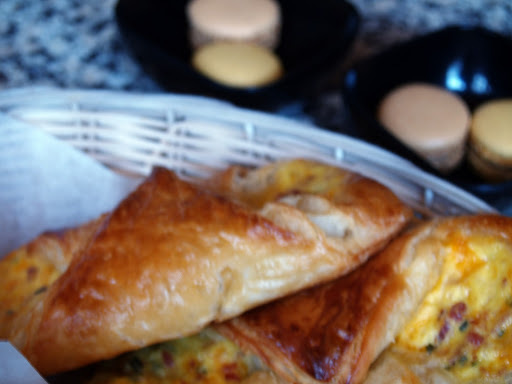 It's flaky, buttery and fresh. And the macarons, those delicate French macarons, transported us to Paris. Ok we might have indulged a little bit... and to think that it's breakfast. 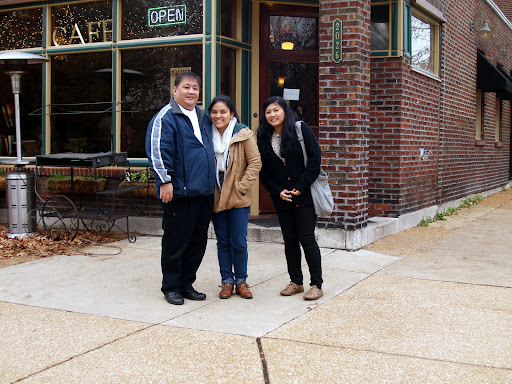 But for my girls who were just fresh from a red-eye flight from Cali, and for my brother who was still jet-lagged from his 30 hour flight from Manila, they needed the sugar... and it was a sure way to welcome them in my new city, and my new neighborhood. Guess who was at the Rue today? It's Mayor Slay! Here are some snapshots we took. 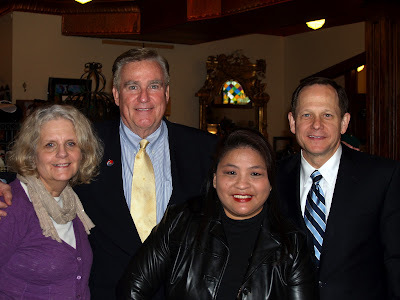 Araceli (the owner) is the lady on the left and Mayor Slay is the gentleman on my right. I know leaving San Diego must be difficult for you and I know you lived in a very nice neighborhood over there. 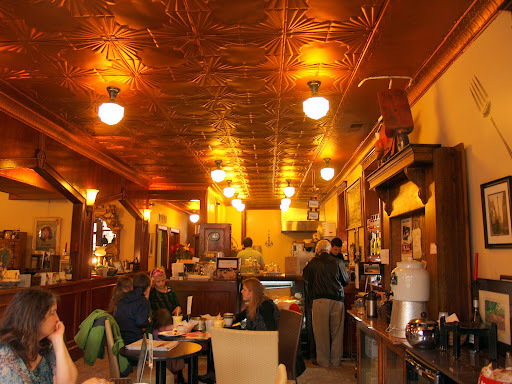 But looking at this quaint cafe, Im convinced that you did pick a good neighborhood again. I wish you all the best in STL! 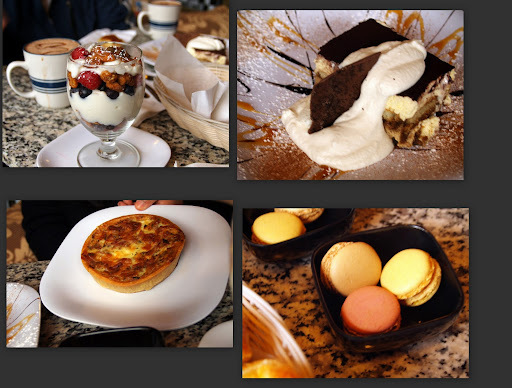 What a beautiful cafe, and a great restaurant review, Malou! Such a charming place and has the best hot chocolate on earth! How lucky can you get. I love the vibes of that shop and I can imagine the warm cheery hostess. So unheard of in these parts. Wow this restaurant looks good! I like the moldings on the ceiling. Now I'm in the mood for croissants and hot chocolate. I've been to Lafayette square but I haven't been to the Rue yet. Maybe it's time to go check it out. I moved to STL from NY and Rue Lafayette is one of the main reasons I stayed! There is nothing like it even in NY. STL is very lucky to have them. The entire staff and dog are the ultimeate, the food always great! I found Rue Lafayette about a year ago and live about 25 miles away but go every weekend! They have Jazz both days during breakfast. The bands are incredible, what a gem of a business. It is a MUST! So glad you found it. 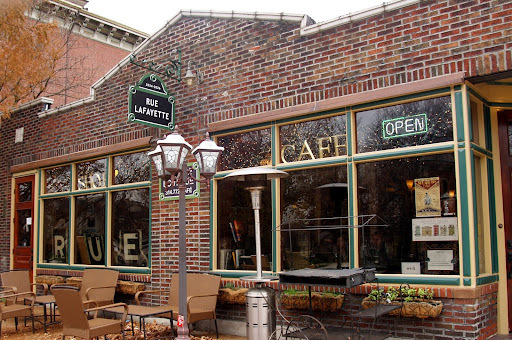 Rue Lafayette is one of the best examples for St. Louis City. It feels European, sophisticated and has a wonderful feel of what the 1920's could have been at their very best. Not your typical cafe where people do not interact. Rue Lafayette is a place where people talk, meet and make connections daily. The food and coffee are the best and I am addicted to their hot chocolate! Having lived in Chicago and LA I am not easily impressed but this Cafe takes my breath away.